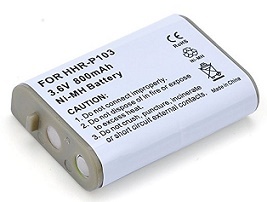 HHR-P103: 3.6v 800mAh long life NiMH Battery for Panasonic cordless phones. Pack size: 1 3/4" long x 1 1/4" across (3 cells welded in plastic housing). Replaces model #s HHR-P103, HHR-P103A, TYPE 25, N4HHGMB00001, N4HHGMN00001, HHR3SPA2B. Compatible with the following models: KX-TD7680, KX-TG2352, KX-TG2352B, KX-TG2352S, KX-TG2352W, KX-TG2382, KX-TG2382B, KX-TG2383, KX-TG2383B, KX-TG2383BP, KX-TG2383PK, KX-TG2383S, KX-TGA230, KX-TGA230B, KX-TGA230W, KX-TGA230S, KX-TGA2352, KX-TGA271, KX-TGA271A, KX-TGA271B, KX-TGA271V, KX-TGA271W, KX-TGA272, KX-TGA272S, KX-TGA273, KX-TGA273S, etc.